I’ve recovered enough from the food frenzy which can now be referred to as the inaugural OC Foodie Fest, to give you a short recap. As with any inaugural event that is a huge success, it involved long lines, traffic gridlock, some disgruntled attendees, and thousands clamoring for more! A huge shout out to Taco Dawg (@TacoDawg), Ashley Elliott (@AshleyEliott), Justin Moore-Brown (@BigHeadAsian), and Anthony Xavier (@AnythingAnthony) for their tireless efforts in pulling off this mega event. I think this video by the talented Jonathan Nafarette (@Johnathon360) sums up the energetic vibe emanating from this eating extravaganza held at the Honda Center this past Saturday. You can be sure that this will not be the last OC Foodie Fest! Congrats to The Lime Truck, Chunk n Chip, and Great Balls on Tires for capturing the hearts, tummies, and votes of the hungry masses to win Yelp’s Best of the Fest’s awards. AND, it really wasn’t ALL about the food, these types of street festivals also give local artists, local musicians, crafters, business and charitable organizations a venue and a way to get the word out. OC Foodie Fest raised over $10,000 for Child Share, Pretend City, and Cart for a Cause. So take a minute to check out what these organizations are all about. For more about the gourmet food trucks, photos, videos, and information on future events visit OC Foodie Fest’s website or their Fan page on Facebook or keep up on what’s happening by following OCFoodieFest on Twitter. This is @She’s Cookin’ signing off for now. Bree – Foodie Fest was never billed as a charity event. I contacted the organizers of the event who stated they donated 20% of the proceeds AFTER covering costs. It is very expensive to put on an event of this scale. The charities received over $10,000 and Cart for a Cause donated an additional $1,500 to St. Vincent’s. If you have concerns, I would suggest that you contact the organization directly. It was a fun and very successful event. Thanks for giving a shout out to the crafters. YOU are the only review I’ve read, including the OC Register and OC Weekly that even mentions any of the local artists and crafters that were there lending their support to the event. 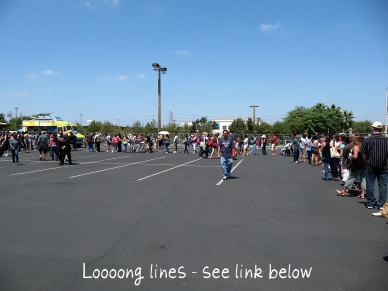 .-= Shari´s last blog ..OC Foodie Fest =-. Shari – Thanks, the artists, crafters, vendors, musicians, dance teams, etc. made it much more than just a food event. How was the exhibitor response to the event? I understand cost however with police, rent, leases, employees they in no way spent that whole $102,000 ++ ONLY from ticket sales. Bree- Have you ever put on an event of this magnitude yourself? I have worked with multiple organizations and have thrown many events. Why dont you call Honda Center and ask them how much it is to rent the venue ( of OC FoodieFest size) because I’m guessing it’s around 50k for the day. So if your stating that they made 102k… that minus just the venue rental (50k), that leaves them with 52k. Not to mention that they need to pay for security, employees, advertisement, porta potties, chairs/tables, etc. So for them to actually raise $10,000 for charities plus an additional $1500.. that’s pretty damn good. And if you don’t so, why don’t you write a check out to them topping that amount. Priscilla, I think because it was the first time they did the event, there needs to be a few changes to get people in tune with the fact that there are even vendors there. I heard sales weren’t so hot but the vendors thought it had potential. The organizer of the vendor portion already made some suggestions for next year such as, putting the food tables where the vendors are and not over off the sides so far away. Add shade so people will hang around longer. I know I did a lot of pr to get customers to my booth and it was still really tough. Hope next year is better. Food trucks are big here in Austin too. I don’t know if we have a festival yet…but we should! I love going to foodie festivals, and I hope to go to a few this year! 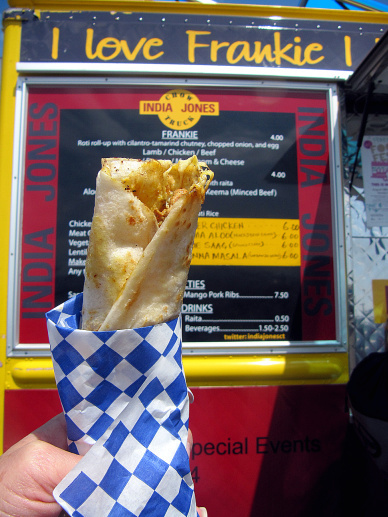 I’m sorry that there were some long lines…nothing can be more frustrating when there is good food to be had! .-= Monet´s last blog ..Herbed Monkey Bread =-. 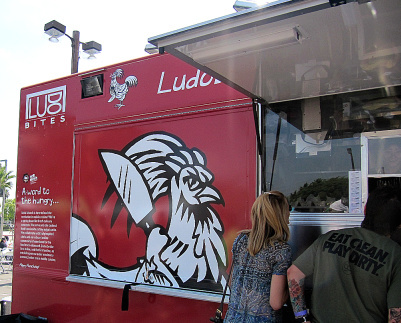 There were many trucks that had the luxery of long lines…my friend nearly passed out while we were in line at the Buttermilk truck and by the time we got to order, she ordered 1 of everything. I have been looking at all the photos and videos from OC Register, She’s Cookin’, and any others to see if I was in any of them…nope! I was hardly missable, I had a bright green long sleeve fishing shirt and it saved me from getting a sunburn. 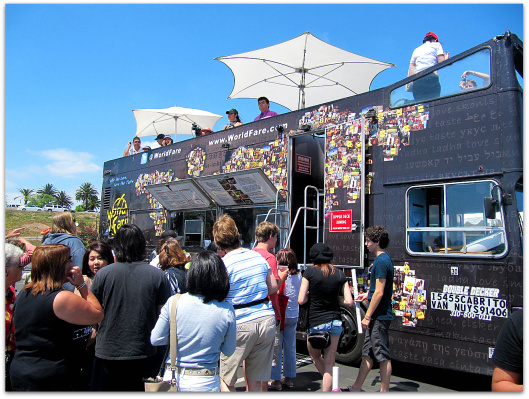 Unfortunately, when I went to the mini foodie truck fest in Irvine, the sun paid me back. I finally got to eat at Dan Dan BBQ and Oh For Sweet Sakes! @the michelin project – I agree wholeheartedly! And, I thought that might have been Ludo! @Erika – I’ll look thru my other photos for a girl in a green shirt. Sounds like you enjoyed plenty of noms!